Anne Waldman has been speaking about the “outrider” tradition since 1974 when she and Allen Ginsberg founded the Jack Kerouac School of Disembodied Poetics at Naropa, a Buddhist-inspired university in Boulder, Colorado. This book gathers several essays, poems & rants, an interview with her by Matthew Cooperman, and an interview by her with Nicaraguan poet Ernesto Cardenal in an attempt to further articulate a sense of this tradition from Walt Whitman to the present. Not a dry presentation, this book is an fierce and loving look at what poetry can be. Outrider is an iinvocation of “lineage” as a challenge toward examining the practice of poetry and the links of its history. This awareness of lineage encompasses both what has been inherited and what needs be passed on. Waldman’s Outrider is a provocative contribution to a post-millennium poetics. In this superb collection of recollections, meditations, interviews, poems, notes, and manifestos, Anne Waldman writes an indispensable chapter in the history of American poetry, one at once brilliant assessment and inspired exhortation. The “outrider,” edgy icon of post-Beat authority, becomes the trope for a poetic pedagogy involving avant-writers from Stein and Olson to Ginsberg and Ernesto Cardenal. And surely the term also invokes the rebel angel Gerard Manley Hopkins — he whose outride syllables “ride forward or backward from the line in another dimension.” Waldman maps this “out” dimension as a visionary poetic landscape where compassion and commitment are still possible. From a life in which every aspect of the day is a radical act of poetry and community emerges — if we are lucky — a documentation of that very life. In Outrider, we encounter a relentless drive to know, revolt, and review with equal parts honesty and abandon, as only Anne Waldman can produce. Take this ride through geographies of ideas and conversations and come out with your hair aflame and your tongue out. 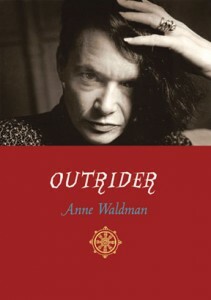 In this dark era of un-ending wars, Outrider reminds us “there is no human dimension in any given period of history without poetry.” Anne Waldman convincingly reaffirms that poetry, essential element of human consciousness, state of mind, can take action as a witness to injustice and “speak to power” effectively. It stands opposite the ignorance of plutocracies that hold power over human life, and offers a rival government that can help save us from the tired, obsolete model of war killing, show us a different version of the world, and the inter-connectedness of all life forms. One comes away from this lucid and extraordinary book knowing — reminded, unforgettably — that poetry is a consciousness that can stop us from being “planetary fools,” if only we will pay attention, and can help humanity chart a necessary journey to a compassionate world in which we take responsibility for where we are going, and where we care for one another and the planet at the same time. because we are trying to wake up the awareness of the world…. One cannot help but connect this writing with that of other inside observers, Olson’s “Projective Verse” essay, Lawrence Ferlinghetti’s “Populist Manifestoes,” and Kenneth Patchen’s brilliant “The Artist’s Duty” statement within his Journal of Albion Moonlight. Like these open declarations addressed to the writer tribe, Waldman’s own fast-speaking manifesto capture the spirit of this new poetry of engagement (1970’s to present). Though the prose-poems contain brilliant fragments, when Waldman is interviewed (by Matthew Cooperman and of Nicaraguan poet Ernest Cardenal here) she gains coherence and momentum and delivers comments that are astute, informed, and comprehensive. The dynamics of her hard-earned poetics of inclusion and revolt are laid out as mosaic stones to walk along. Topics include how her vow of compassion and her performance method embrace in the “wild mind,” how women writers of poetics struggle to be heard, how alternative writers have gone unappreciated, including the whole mimeograph revolution of the 1960’s: “The ‘alternative poetics’ had to do with economics, with urgency, with getting work-in-progress out as it was written. Which then would engender a response and perhaps guide the way the writing would go. It enhanced the conversation as writers.” (83) Culture and art are linked. The second half of the book contains many valuable Waldman tributes to female writers of the tribe Lorine Neidecker, Gertrude Stein, Mina Loy, H.D. and others, and a developed and revealing study of Neidecker’s work through linking it with the poetics of silence in John Cage and Henry Thoreau. There are filmic memoirs of “Beat Roots” and another built around the HOWL landscape. The book is enhanced by poet photos from the 1970’s on. As insider and spokesperson Waldman witnesses, reveals, and demonstrates the vision and method of Outrider writing and traces its lineage for us as readers and writers in this illuminating collection. Larry Smith is the author of Kenneth Patchen: Rebel Poet in America (A Consortium of Small Presses 2000) and Lawrence Ferlinghetti: Poet-at-Large(Southern Illinois University Press 1982).